1. 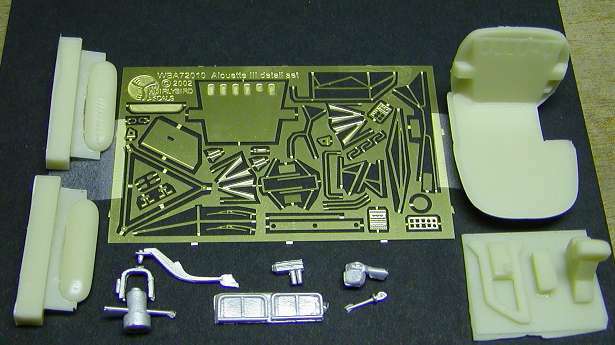 New from Whirlybird is their detail set for the 1:72 Heller Alouette III, #WBA72010. This comprises parts in resin, white metal, and etched brass. 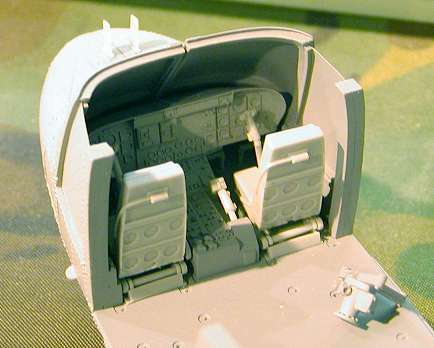 The resin parts are the floor (incorporating a winch well) & rear bulkhead, instrument binnacle, aircon duct and switch panel, an unidentified box, and two flotation bag housings. In white metal you get a rear cabin seat, winch head, winch hook, NiteSun searchlight, bracket & mounting arm, and flare dispenser. The etched brass sheet includes instrument and switch panel faces, panel shroud, rudder pedals, flotation housing brackets & tubes, winch well detail & door, winch arm and brackets, glide slope antenna, pilot's door steps, navigation lights, flare dispenser brackets, various patterns of rear-view mirror and bracket, rotor bracing struts, windscreen wipers, roof-mounted towel-rail antenna, and door handles. Issued as a separate set, #WBA72013, is a pair of floats for the Alouette III. In this you get a pair of resin floats, plus white metal mounting bars. 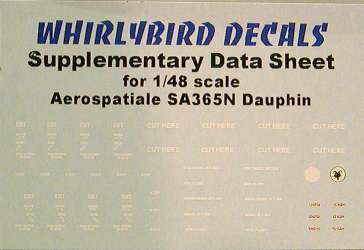 The 1:48 Dauphin sets are basically the same as their previously issued 1:72 sheets #WB72002 & 72003, but with the addition of supplementary sheets of detailed stencil markings. 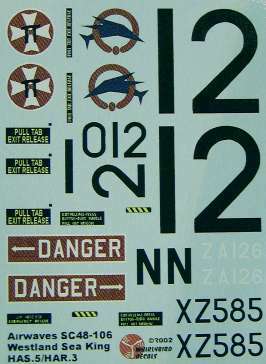 The Sea King sheet has markings for roundels, serials and titles for XZ593, plus comprehensive stencilling, and an extra sheet of rotor slinging stripes. Whirlybird products are available direct from Whirlybird, or online from Linden Hill Imports. 2. 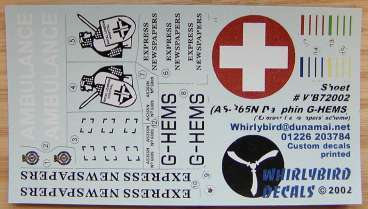 The next sheet from Max Decals, scheduled for Jan-03, will include a selection of Irish Helicopters; 1:72 S-61N's, IAC Dauphins in 1:48, plus Garda (Irish Police) Air Support aircraft (Squirrel and EC135). The first will feature Nordic / Baltic helicopters, including Norwegian UH-1B and H-19, Swedish HKP (Super Puma), and Mi-8's from the Baltic states of Latvia, Lithuania and Estonia. The second will be the long-awaited Antarctic sheet including UH-1B, UH-1D, UH-1N, H-19, and HU-2A from the USA, some with noseart, a South African Oryx, Japanese OH-6, Chilean Bo-105, and a Russian Mi-8. Check with Max Decals for further details to be published soon. HAR.3/3A, RAF yellow SAR schemes, both Squadrons, plus the grey Falklands aircraft. 4. 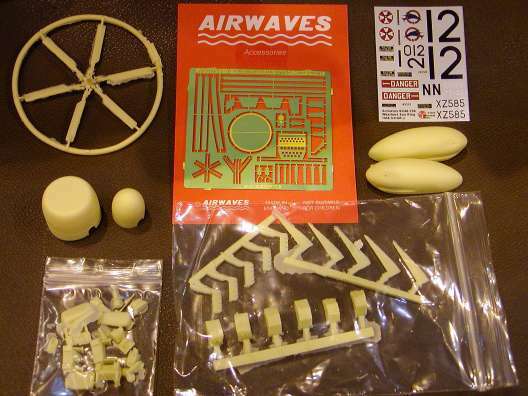 Airwaves have released conversion set #SC48-106, Sea King HAS.5/HAR.3, which is designed for the Hasegawa / Revell SH-3 Sea King kits. This set is in resin and etched brass, with a decal sheet made by Whirlybird. 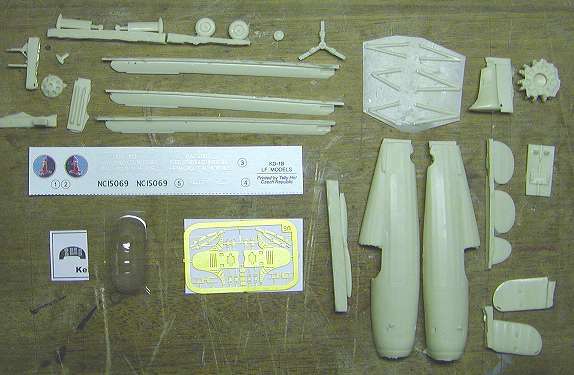 The resin pieces are a pair of sponsons, a six-blade tail rotor, two alternative dorsal radomes, rotor blade modifications, and a large number of aerials, antennae, counter-measures boxes, etc. The brass parts include the port side fuselage strakes, seat belts, blade antennae, wiper blades, nose light, door steps, mirrors, etc. 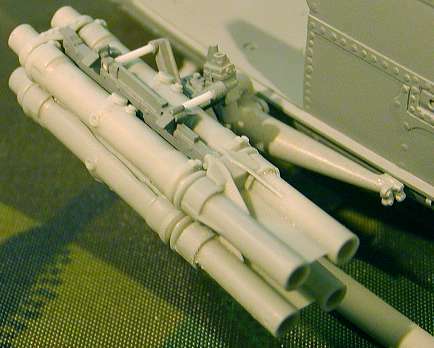 The conversion parts can also be used to make Sea King HAS.2, HAS.6 and HAR.5 variants. 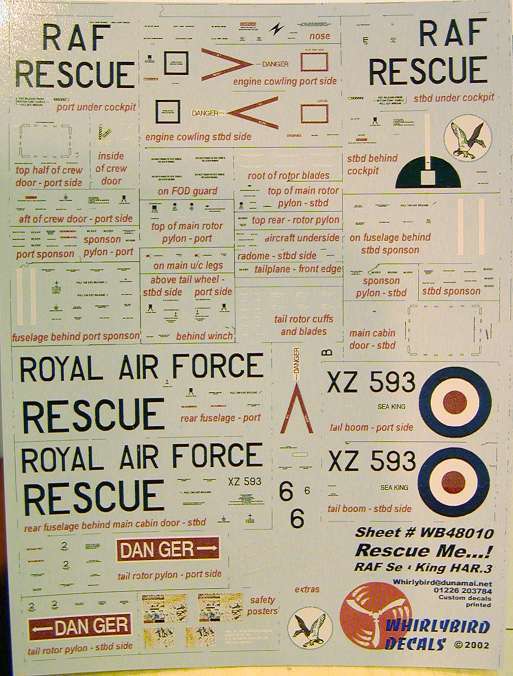 The decal sheet gives basic markings for XZ585, an RAF 22 Sqn. 'A' Flight HAR.3 from Chivenor in 1995, and ZA126/012/N, a HAS.5 from 820 NAS in 1983. Titles and more detailed markings are intended to be sourced from elsewhere. 5. 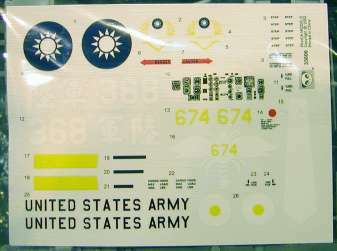 The decal sheet in Panda Model's #35006 UH-1D 'Wasp' kit seems to include markings for an aircraft from Taiwan as well as those for the US Army. 6. 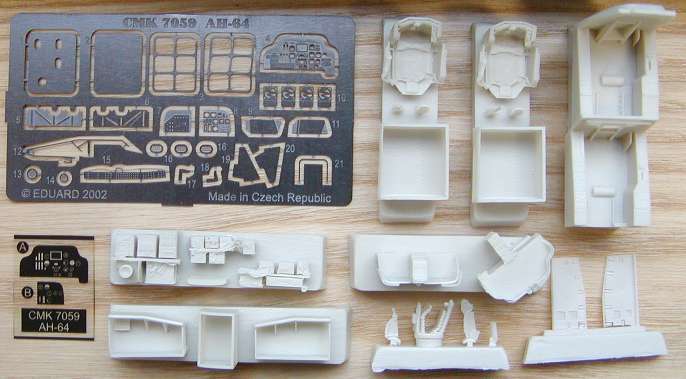 Czech Master's Kits 1:72 AH-64A Apache Interior set #7059 includes about 25 resin pieces, an etched steel sheet, and acetate instrument dials. Together these make a new cockpit tub and seats, instrument panels, various avionics bays and their contents, and detail parts for the gun. 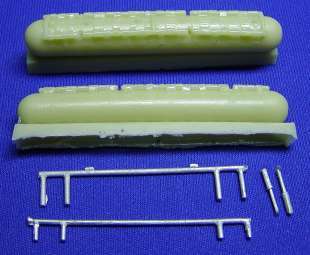 It is intended to detail the Academy kit along with their engine detail set #7058 - see HKN #150. 7. Accurate Armour have almost finished the masters for their 1:35 Lynx AH.1, and test shots were on display at Scale ModelWorld. This project has taken about 8 years to get to this stage, but they are now hopeful that it will be completed early in 2003. 8. The latest variant #7246 in the LF Models series of Kellett autogyros is the KD-1B NC15069, as used by Eastern Air Lines for airmail contract work. It is unfortunate that LF persist in spelling Kellett incorrectly ("Kellet"), because on this occasion the word appears on some of the decals. Apart from that small complaint, these are beautifully made kits. 9. The Hobby Company, importers of Italeri kits to the UK, were displaying what was claimed to be a build-up of the 1:72 Italeri Cormorant. This appeared rather inaccurate and was hopefully just a Revell Merlin with a few random modifications and Canadian colours. Release is allegedly due before the end of November, but there was no solid news about the 1:48 Osprey re-issue and the 1:48 Seahawk. 10. In December Revell will be releasing #4458, their 1:48 MH-60K. It is assumed that this will be based on the Italeri moulds. 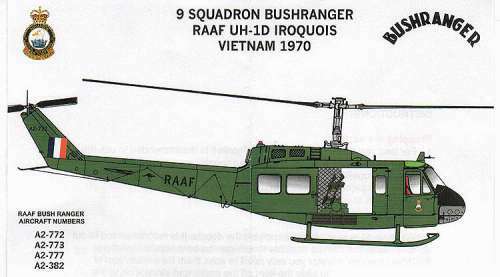 In January Revell will issue #4011, their 1:144 CH-53G with 'Camouflage' markings, probably similar to those in the recently re-issued 1:48 version. The only other helicopter due from Revell in the first part of 2003 is #6618, a 1:100 AH-64 Apache in the 'Easykit' range (quick assembly, pre-coloured pieces), scheduled for April. 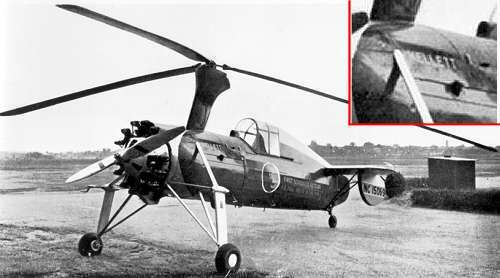 The Revell representative at Scale ModelWorld said that there will be "at least two completely new helicopter kits" later in 2003. Revell's website is now available in English as well as in German. 11. PWMP(Plastic World Modeling Products) from Belgium will be releasing a 1:48 update set for the Hasegawa / Revell Sea King. This will include the shorter stabiliser and the de-mountable FLIR as used by the Belgian Sea King Mk.48. 12. It appears that the Berkut Mi-171 version (#72011) of the Zvezda Mi-8 has not yet been released, at least not in the 'west'. 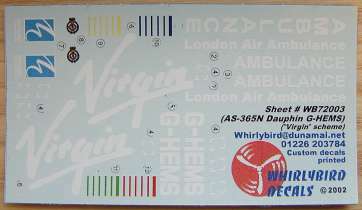 This and a Ka-27 (#72010) are due to be available from the UK distributor (Pocketbond) early in 2003. 13. Cutting Edge have re-issued their MH-53J Pave Low Weapon Set #CEC48001. 14. Two Bobs Aviation Graphics should have their AH-1W Cobra "Whiskeys in the Mix" decal sheets #48035 and 35001 ready in about one more week. 15. 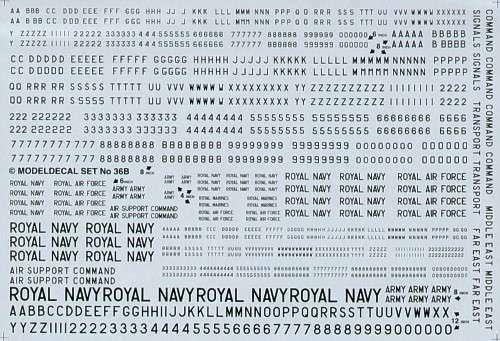 Hannants have re-printed ModelDecal sheet 036A (UK 4" to 12" black letters, numerals & titles), re-numbering it as #036B in the process. They have added the words 'Air Support Command', 'Transport', 'Middle East', 'Far East' and 'Signals'. 16. Hasegawa have released their JGSDF version of their AH-64D Apache #09452 in a speculative 3-colour camouflage. First deliveries of the real thing to Japan are expected to take place in 2005. Thanks to Lorna Jenkins, Gary Madgwick, Joakim Dцrner, Joe Maxwell, David Nilson and Roger & David Evans.